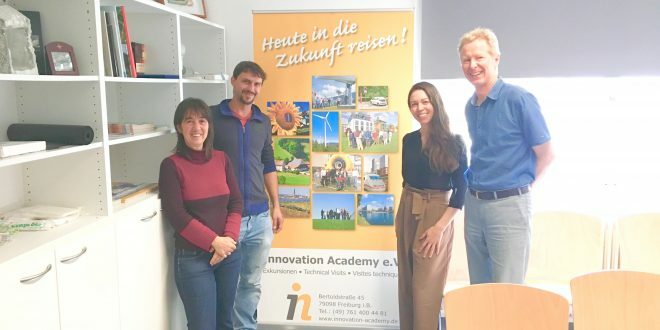 Thanks to the substantial support of the Career Ready Fund (CRF), during the summer academic break iPRAKTIKUM lead Helena Juenger spent a busy and very successful week in the southwestern corner of Germany firming up partnerships with a number of innovative organizations in the sustainability field. The trip represents the next step in the creation of our first Germany-based internship program: ecoHub Freiburg. With its strengths in green technologies, urban planning and design, manufacturing, and high-tech industries, Germany is the number one non-English speaking destination for students seeking international learning opportunities. ecoHub Freiburg focuses specifically on businesses, NGOs, and university institutes in the Freiburg region, which is a hotspot of activity in the areas of sustainability research and policy, green entrepreneurship of many kinds, and the location of Vauban, one of the world’s most sustainable urban developments. U of T students in a range of fields, including environmental and social sciences, architecture, urban studies, and humanities disciplines, will gain valuable field experience with sustainability and environment-oriented organizations. ecoHub Freiburg placements will augment students’ courses of study with structured international experiences designed to develop intercultural competence, a deep grasp of global environments, and work-related skills. We are very pleased to have secured partnerships with nearly all of the organizations that we had targeted for our Freiburg visit. Particularly encouraging was the response of the Ökostation. Ralf Hufnagel, who runs this unique environmental awareness and education center with Ute Unteregger, has agreed to serve as our primary consultant and ‘ambassador’ in Freiburg. We look forward to this collaboration and sending our outstanding U of T students to one of Europe’s greenest cities.